The GLIDECAM SMOOTH SHOOTER does not come with a hand-held stablizer**; however, it is specifically designed to be used with them. If you already own one of our hand-held stabilizers, then you will be able to use it by simply attaching it to the end of the Smooth Shooter's Support Arm. Your Glidecam hand-held stabilizer** does not need to be modified to work with the GLIDECAM SMOOTH SHOOTER. You can use your camcorder's flip out LCD monitor, or a monitor that is attached to the base of your Glidecam hand-held stabilizer**. This allows for remote viewing of the camera's image without disturbing the orientation of the system. When using the Glidecam hand-held stabilizer** in hand-held mode, it is your arm that carries all of the weight. 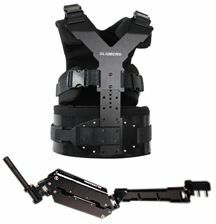 However, when the Glidecam hand-held stabilizers** are used with the SMOOTH SHOOTER, it is the SMOOTH SHOOTER'S Spring-loaded Support Arm that carries all of the weight. Because of this, you will now be able to shoot for extended periods of time, whereas before, the stress associated with hand-holding the weight reduced your shooting time. **The Glidecam Smooth Shooter System is designed for use with the Glidecam XR-2000, XR-4000, HD-2000, HD-4000 and the DEVIN GRAHAM Signature Series Glidecam Hand-held Stabilizers. The weight plates provided with the Glidecam Smooth Shooter System are not compatible with the DEVIN GRAHAM Signature Series. We offer for this product a 2 hour introduction workshop and also a 1 day trainings course. Please contact us to arrange a meeting or even get more Information.